I did a post when my son was 10 months old called Easy First Finger Foods for a Baby . This is an updated post on favorite foods that we use during meal times now that he is a couple months older and more proficient at eating. For a quick easy breakfast we mix 1/4 cup of Gerber Oatmeal Cereal with a TBSP of juice and one single serve Mott's Original Applesauce or Cinnamon Applesauce. Mix it all together and you have a yummy cereal breakfast with fruits, iron and vitamins :) My little man loves this! Another breakfast option with a little protein is an omelet or scrambled eggs! It took a couple tries before my guy decided that eggs were yummy, but he loves them now! I usually use nonstick spray in a pan and make up a one or two egg omelet then I will add a slice of cheese on top for his serving of dairy. After it cooks and the cheese melts I place it in the freezer so that it cools quickly. After a couple minutes, I take it out and the cheese isn't as gooey so it is easier to cut into small pieces. My little guy loves macaroni and cheese! I'm guessing that is pretty much a universal on little people though. I only have one little person in my house right now and I don't know about you, but I don't want to make a whole box of mac and cheese every time I feed it to him. So, I have started buying single serve Kraft Macaroni and Cheese. These packets shown to your right and below are cheaper then the ones that come in individual bowls. 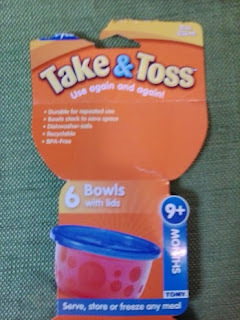 They sell these at Walmart and they come without the bowls so they are more cost effective! One option for part of a meal is Beanee Weenee. Now most of the time I take out the hot dogs (and eat them myself) and give little man the beans. If your little one is older and can handle hot dogs then make sure to cut them up in small enough pieces. I may be a worried first time crazy mama but if little man eats the hot dogs in Beanee Weenee they are cut up to the size of my pinky nail. : ) Better safe then sorry. I also like to put sweet peas mixed in with the beanee weenee! My little man also loves turkey breast deli meat. I cut it up into square pieces and give it to him with cut up pieces of sliced cheese or vegetables. This is a good way to get some protein into a meal without the choking hazard of most meats in those early stages of waiting for teeth to come in. Vegetables, vegetables, vegetables! So good for the little people! (and the big people too) As much as fresh vegetables may be nutritionally good, I have a hard time getting them soft enough (even with boiling etc.) for my little man. So, I used canned veggies. He loves green beans and carrots. He will tolerate peas, and actually does eat asparagus too! YEAH! He also eats canned beets which are a little sweeter treat on the veggie list. Of course he doesn't eat a whole can in one sitting so I put the rest in a small plastic container and save it for lunch tomorrow. We have a ton of fresh cucumbers from are garden, but I've never given any to my son because they are not soft enough. Well, yesterday I was chopping one up and I got the neat idea to cut out the center and give him pieces of that! It worked and he liked it! The seeds were small and soft enough that he didn't have any problem with it and I enjoyed eating what was left! Fresh fruits are soft, yummy and so good for us! There is just no reason not to have them in your little person's diet. Banana's, blueberries and raspberries are favorites of ours. I half or quarter the blueberries and they make a healthy, yummy snack or desert! Little man can't get enough of them! At Sams Club you can get 2 lbs of blueberries for a little under 6 dollars! YEAH!!!!!!! We were out in our garden picking tomatoes and my son tried to take one and eat it! That's when I realized well I guess you can have that, but I don't think you'll like it. I peeled the skin off part of it and handed it to him. He dug in! He loved it! I peeled the whole tomato (quite a large one) and gave him pieces at a time. He ate the entire thing! The lesson here don't make the mistake I did and assume your child won't like something just because it isn't sweet and sugary! Try out tomatoes! Other fruit options are canned or refrigerated fruits. My little man can't get enough of Mandarin oranges, grapefruit, diced peaches, pears and mangoes! For a quick snack on the go Graduates Lil' Crunchies is a must have! I have never seen my little guy get so excited for a snack as when he sees me coming with this can! They are easy for him to hold, dissolve and eat with little to no mess! They come in a range of flavors including veggie dip, garden tomato, mild cheddar, ranch, apple and sweet potato and cinnamon maple. Another quick and easy snack is string cheese sticks. I cut them up into small pieces and they are an enjoyable favorite for snack time. These take and toss bowls are cheap and small so they don't take up to much space in the fridge too. I love using them for extra food to save for later! I've washed them in the dishwasher with no problems at all : ) They are also great to carry food on the go in a small cooler or thermal bag! Hi Joanna, wow this post is really helpful. I get tired thnking what to offer to my baby that he would eat readily. I also love the options u gave, like the walmart brand canned fruits & veggies. it never ocuurred to me to give my baby that. i just got an idea ,i will type in my baby's menu & his food that i offer him. & i would love it if u let us know what food u offer at what time. please give me full schedule of your baby. & also his nap time. my baby isnt sleeping on time & nor is he showing much interest in food. i love the way u wrote your lil man loves it... i wish my lil man eat something just as fondly. okay , my baby is 14 months old & he is a boy. doctors say he is quiet a big baby , but i feel hez just okay for his age. i have sen bigger babies. but my baby is really driving me nuts to eat & sleep these days. would u also please include a thread about the activities u make your baby do. I also love it that u have a garden. i dnt have garrden. & i live in apt.please also include a thread about how u prepared your mentally for new baby?? is it tough?? toddlers work is exhausting! how do u manage?? do u ahve help?? also include ur schedule of work.. OOOPS!! i guess i demanded too many things.. but take ur time.. & i know women love sharing... i would also share with u my baby's schedule through my blog. & i LOVE the way u included REAL pictures. this seems like real mama's real tips.. not from internet., THANK YOU.